Eden Softplay is an exciting 4-tier indoor play centre for under-10’s* hosted in the building of St Saviour’s Church, Nottingham. 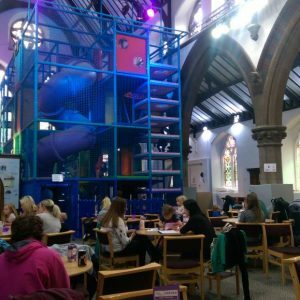 The soft play cafe is popular with people across the city looking for a comfortable and fun space for all the family. Owned by the church and run as a community social enterprise, we are looking to lead the industry by achieving a number of social aims as well as being a top place for fun! We are working to bring you the highest levels of quality and affordability while making no compromise on our business ethics. *There is a height limit of 148cm in place. No child over 148cm will be allowed to play in the soft play area, even if they under 10.